Oh boy, do I feel like an idiot. 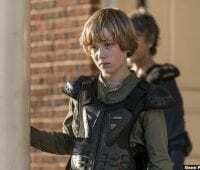 For four episodes of this new season of The Walking Dead I’ve been spouting praise about a renewed sense of purpose in a show that was at least two years into its sharp decline in quality. I was loving the subtle and growing division between the characters, and the quite reasonable motivations for that division. 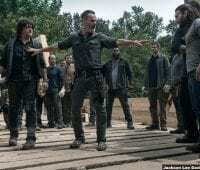 Then The Walking Dead did what I was afraid it was always going to do, it regressed into that show that I had to take the piss out of every week. 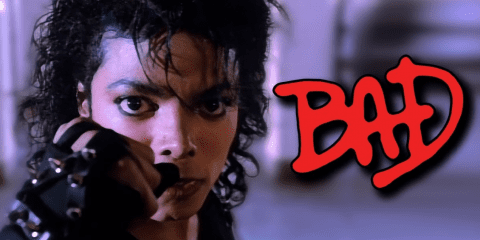 As a reviewer of television, I much prefer praising shows than tearing them to pieces. I want to enjoy what I’m watching and tell you good people exactly why, and I couldn’t believe that I was actually enjoying The Walking Dead again. I’m sure lots of you were with me there. Then Rick went kablamo! Which is tired writer speak for “left to star in his own spin-offs and never mind the feeling of betrayal that most of the fans were left with. While that sorry excuse for drama was last week for us mere viewers it has been six years in the show’s timeline. That’s right, we have yet another time-jump that allows the writers to set up new relationships, new problems, and retread plots that we have seen a million times before. I wish I was in that helicopter with Rick. So, what has changed in those six years? Carol and Ezekiel are married and the now teenage Henry has become their annoying surrogate son. Michonne is head of security in Alexandria, though she acts as if she is the boss. 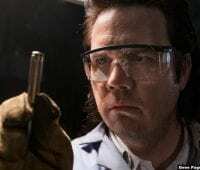 Negan is still rotting away in the same cell telling an older Judith that math is a bunch of bull. 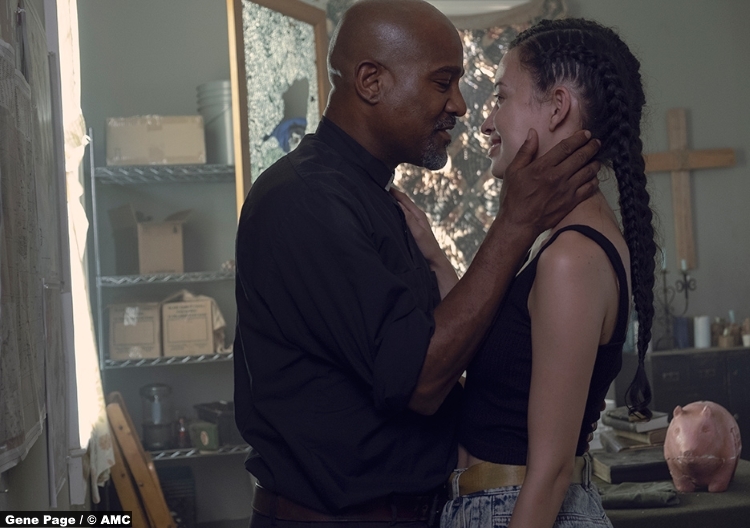 Most disturbing of all is the ship that no one wanted in the romantic pairing of Father Gabriel and Rosita. Oh, and Daryl is living by himself in the woods because of reasons. Honestly, all of this would have been more bearable if Rick’s death came mid-season, that way we wouldn’t feel the whiplash of a second-time jump in five episodes. 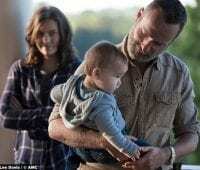 While Rick was the main character, his exit didn’t mean that everything else that was going on prior to his supposed death is suddenly unimportant. The new world that Rick wanted was crumbling, and I get that his death could be the catalyst to bring that dream to an end, but I would have preferred seeing it happen than just jumping ahead to a new status quo. 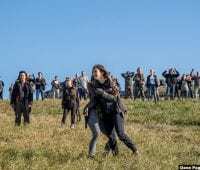 That’s The Walking Dead for you, just when it was interesting again they blow up the damn bridge. Speaking of the bridge: did they just leave it the way it was as a memorial to Rick? I thought the bridge was important, more than a symbol to unite the disparate communities but an actual bridge to physically connect them. There’s a lot of stupid stuff in this episode, that I will get to, but the bridge reveal just shows us that the previous episodes of this season mean absolutely nothing in the grander scheme. Where Are You Now doesn’t just introduce the new era of The Walking Dead, it also gives us some questions about how these characters got here. Michonne is the most compelling character, at least that’s the idea, of the episode as we begin with her talking to Rick, and by extension us, as she pretty much pleads with us to stay the course and be patient with the show. In fairness, apart from some prime Carol mayhem, there isn’t a lot here that fills me with confidence for the coming episodes. In terms of the surviving communities, we only see Alexandria and The Kingdom, while Hilltop gets a mention which is more than can be said for Oceanside. The Sanctuary fell at some point, and the last of the remaining Saviors are wiped out in glorious fashion by Carol. Some things change but she is still a badass. The main plot concerns the group that Judith saved from Walkers at the end of last week and whether they are allowed to stay in Alexandria. A note for the people that brought this group in, if you’re going to hide the route from the newbies by putting hoods on them, maybe don’t have a huge sign with the name of the place out front. 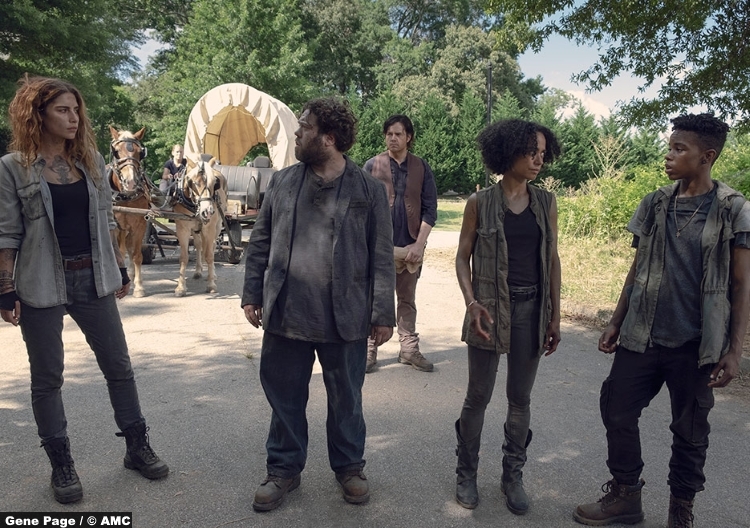 The newbies aren’t especially interesting, the only notable one at this stage is ex-con Magna but that’s only because her plan to kill Michonne was excruciatingly dumb. You know what isn’t a shortcut to making sure you and your friends can stay? Killing the damn leader. That’s it, all the joy and hope I had for this season is gone. 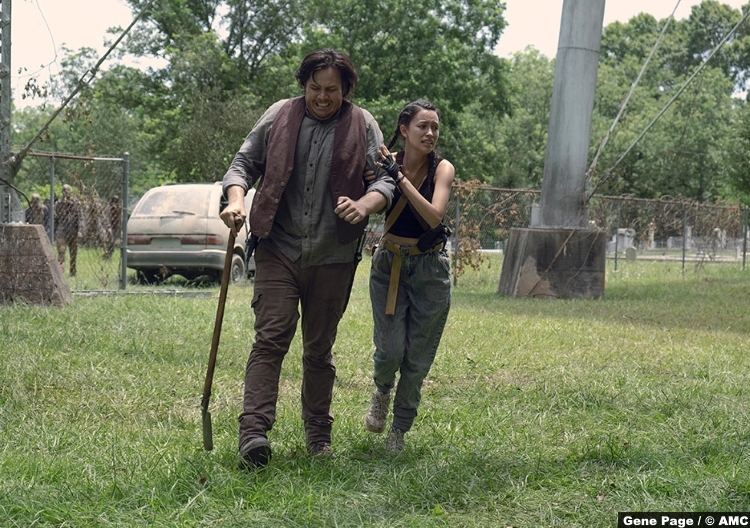 Then there is the big reveal as Eugene (who has become an especially proficient Walker killer) and Rosita hears the horde of Walkers that were chasing them talk to each other. That’s right, the Walkers can apparently talk now. I’m not exactly sure what that means for things going forward, other than the fact that they can say “don’t” before they get a knife in the head. This should be an oh crap moment, but it just feels like the latest cheap way to get us to care about what is happening. In saying that, I’d much rather a talking zombie than whatever this fair is that Ezekiel is talking about. 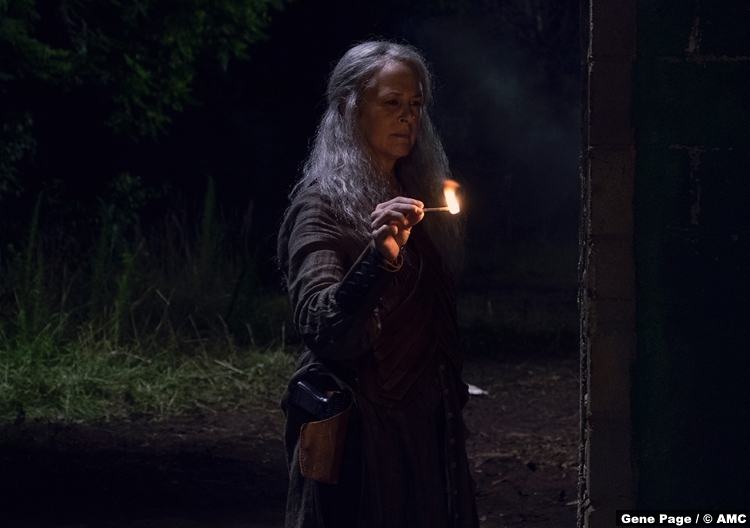 5/10 – Five points for Carol the pyromaniac, and that’s about it.